Solar is Dead – Long Live Solar! Despite the spate of solar bankruptcies in August 2011, rumors of the demise of the U.S. solar industry are entirely unfounded. Far from being dead, solar power is the fastest-growing industry in America. The bankruptcies of Solyndra, Evergreen Solar and SpectraWatt are not evidence of the end of solar, they are evidence of a new beginning. The bankruptcy filing at Solyndra is a result of a decrease in the price of silicon. Solyndra’s more expensive silicon free technology was hurt by a decline in their competition’s raw material costs. Solyndra’s cost of $2 per watt was no longer competitive. As stated in a press release from Solyndra,”Global economic and solar industry market conditions have forced the company to suspend its manufacturing operations.” When Evergreen filed for bankruptcy they cited heavy competition from China and intense competition in the industry. In response to Solyndra’s bankruptcy, prominent venture capitalist John Doerr was quoted in the New York Times as saying, “one failed solar company does not mean the entire clean energy industry is doomed.”Independent of how Solyndra secured a loan guarantee, their approach offered promise. Given the previous shortages and high prices associated with silicon, their technology offered a viable strategy for the time. Falling solar panel prices have caused a supply glut and sliced company revenues. However, the drop in the cost of solar power is actually a positive sign for the industry because it indicates that solar is becoming increasingly competitive with other forms of energy. Between October 2008 and June 2011, the average price of solar modules has fallen from $4.20 per watt to as little as $1.20 per watt. 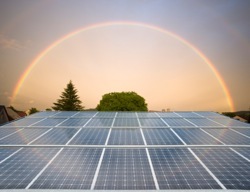 As of June, 2011, California utilities had signed over eight gigawatts of solar contracts. What is most striking is the fact that half of these contracts are below the price of new natural gas generation. Innovation, market pressures and government investment have driven down the price of manufacturing crystalline silicon panels. An analysis from the DOE’s Lawrence Berkeley National Lab reveals record setting price declines. The pre-incentive price of solar in the U.S. fell 17 percent last year, and another 11 percent in the first half of 2011. The Berkeley Lab report indicates that federal and state market-building policies have been instrumental to those gains. The report also suggests that government policy has helped to build scale, bring down costs, and deliver strong economic returns. A US Solar Market Insights Report from the Solar Energy Industries Association (SEIA) and GTM Research showed that 314MW were fitted in the U.S. from April to June, an increase of 17 per cent on the first three months of the year. U.S. photovoltaic installations were 69 per cent higher in the second quarter of 2011 compared to the same period last year. The rate of growth points to a total of 1,750MW of PV capacity being installed in 2011, which is double last year’s total. According to the SEIA/GTM study, the U.S. is exporting more photovoltaic-related components than it is importing (USD5.6 billion in 2010, compared with imports of USD3.7 billion). The 6.8 percent growth we saw in the 2010 U.S. solar sector is remarkable, particularly when compared to the performance of other sectors. As reported by Reuters, the U.S. was a net exporter of solar energy products in 2010, thanks to strong demand from China, Germany and Japan for U.S.-made polysilicon and capital equipment used to make solar panels. On March 29th, 2011, Pew Charitable Trusts released a report which states that G-20 private finance and investment into the solar sector grew 53 percent in 2010 to USD 79 billion, as part of private investments in clean energy technologies that were worth USD 243 billion for the year. On August 10th, 2011, the U.S. Army announced that it is planning to build large-scale renewable energy projects. Solar is an important part of the Army’s ambitious plans to generate 2.1 megawatt-hours of renewable energy each year. A provision in the fiscal 2011 defense authorization will ensure that these contracts go to American companies. As reported in Solar Thermal Magazine, on September 13th, 2011, Energy Secretary Steven Chu announced that the Energy Department had finalized a USD1.2 billion loan guarantee to Mojave Solar LLC for the development of the Mojave Solar Project (MSP). When complete, the 250MW solar generation project in California will increase the nation’s currently installed concentrating solar power capacity by approximately 50 percent. Abengoa Solar Inc., the project sponsor, estimates it will fund more than 900 construction and permanent operations jobs. Despite the recent failures of Solyndra, Evergreen Solar and SpectraWatt, there are more than twice as many Americans now employed in the solar sector as there were in 2009. According to a report titled The 2011 National Solar Jobs Census, the solar industry employs over 100,000 people, and added over 6,700 jobs in the last 12 months alone. Despite the optimistic projections, there is some potential trouble ahead with the Treasury grant program set to conclude on December, 31, 2011. While 2012 may be more problematic for the industry, it is absurd to infer that the entire U.S. solar industry is on the verge of collapse. However, the U.S. share of the worldwide solar-panel market has fallen from a peak of 43 percent in 1995 to just 7 percent in 2010. With Asian competitors dominating the market, government support is more important than ever. In 2010, the U.S. was a net exporter of solar energy products, but in the same year, it was a net importer of solar modules. (The U.S. imported USD2.4 billion and exported just USD1.2 billion of modules, mostly from China). Solyndra, Evergreen Solar and SpectraWatt may no longer be with us, but with support of the private sector and the right government policy, solar’s future in America is bright.